You can use the speed converter to convert between US, imperial and metric speed units. For example, you could convert from miles per hour to kilometers per hour, from meters per second to miles per second, etc. With the Flip button (two arrows in the bottom left corner) you can easily switch between the "from" and "to" speed units. Speed converter supports fractional values. For fractional results, you can select rounding to the nearest 1/2, 1/4, 1/8, 1/16, 1/32, 1/64, 1/128, 1/256. By default, the app rounds fractions to the nearest 1/32. If you do not need to round fractions, just select "-". You can select the number of decimal places you want to display. 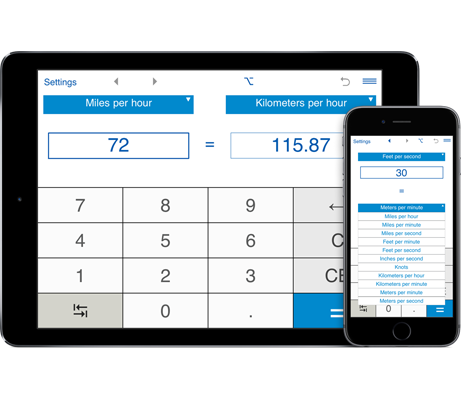 By default, the app displays 2 decimal places.To round results to the nearest whole number, select 0 decimal places. Speed converter keeps conversion history and sends results and history via email.